The city of Rome has always been privileged in its relationship with Western history: constructed over layer upon layer, from Roman to Fascist empires, with corresponding iconic images. More recently, films by Pier Paolo Pasolini and Federico Fellini have contributed to capturing the changes modern Rome underwent, with suffocating traffic passing dazzling locations, long tracks down shadowed streets and lively social gatherings masking potential violence. These images have been qualified as embodying ‘modern’ Rome. The closing shots of Fellini’s Roma (1972) linger on dozens of mopeds fading into the distant black as they abandon the historical centre for an undefined urban sprawl. The sprawl, the latest metamorphosis of Rome, overlaps with historical images of the capital to form a shapeless identity, a fragmentary postmodernity. - Where present and past intersect and overlap synchronically, is it still possible to represent ‘reality’, or possible only to capture fragments of it? - Can we still perceive the city as a ‘master narrative’, or do we need to challenge the notion of one city? - How can the city be perceived in relation to Italian and to European landscapes? 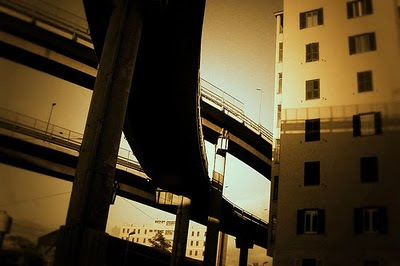 - How does the image of Rome relate to contemporary global cities? - How is this historical shift represented in global cultural products, and how do they redefine our perception? 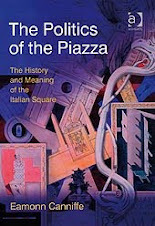 The interdisciplinary nature of this event is acutely represented by its two keynote speakers: Eamonn Canniffe (Manchester School of Architecture; author of The Politics of the Piazza: the history and meaning of the Italian square) and Dr. John David Rhodes (Literature and Visual Culture, Sussex; author of Stupendous Miserable City: Pasolini’s Rome).